A western blot is supposed to give you information on true experimental conditions or differences between samples. It is instrumental for the detection of proteins in research discovery and biopharma. But a western blot can also fool you. Inconsistencies in sample preparation, loading or gel transfer can skew results without normalization. Researchers use normalization to control for the effects of these experimental errors and ensure that the amount of protein from blots reflects biology. New normalization techniques are making it easier than ever for researchers to correct data for variances across data points. One lesser known technique, called total protein normalization (TPN), is one way researchers can ensure their data is robust enough to make faithful comparisons across samples and to draw conclusions. TPN has made a few key advances over last-generation techniques that allow researchers to save time and increase output. In this article, we will be explaining the two main western blotting normalization methods; the older housekeeping protein method and the newer TPN method. For over 30 years, researchers have used housekeeping proteins (HKPs) such as GAPDH, actin, and tubulin as internal loading controls. HKPs can be used to reliably quantify western blots, but only in certain circumstances. HKPs only work if their expression is constant. However, studies continue to show that HKP expression can change with experimental conditions.1-4 This is a notable disadvantage of HKPs as researchers need to expend time and resources to examine HKP levels over the range of experimental variables (e.g. treatment type, tissue type) and confirm that the protein levels remain constant. Another disadvantage of HKPs is that they are often present in saturated levels, resulting in erroneous quantitation. This is because high lysate loads are often required for detection of low-abundance target proteins and HKPs are often expressed in high abundance. Therefore, the linear working range for the HKP must be determined. Different amounts must be loaded on a blot to determine the sample range that produces a linearly proportional signal of the HKP. HKP detection is also time-consuming. In addition to the battery of tests described above, the process of using HKPs requires stripping the membrane after the target proteins have been probed, and re-probing with HKP-specific antibodies. This procedure also introduces variability in results. Within the last ten years, researchers have turned to TPN for a better method to quantify protein expression. In TPN, western blot data is analyzed using the total protein in a sample and therefore normalization is not dependent on a single HKP. The technique is faster, more accurate and more reliable than HKP-based normalization. The best way to measure total protein in a blot or gel is via stain-free technology. For example, unlike Ponceau S stain, stain-free technology maintains its intensity over time and does not sacrifice reproducibility. It also does not require running samples in duplicate as is the case with Coomassie blue. Stain-free technology uses a proprietary in-gel chemistry that allows visualization in less than five minutes with any stain-free enabled imager. Stain-free TPN also does not require extensive optimization: no need to probe the blot with antibodies, or for staining and destaining steps prior to imaging. The stain-free approach does not interfere with downstream applications such as western blotting or mass spectrometry, so there is no need for duplicate runs. Therefore, stain-free is superior to most-dye based TPN methods for visualization of proteins because it increases the sensitivity and reduces the complexity of existing workflows, saving researchers time. 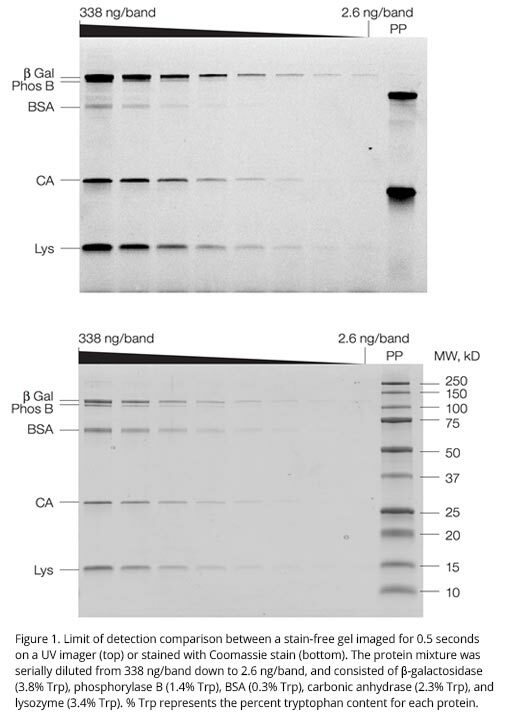 Because of reproducibility challenges associated with HKP normalization, TPN has recently become the preferred method of western blot normalization by publications such as The Journal of Biological Chemistry. Stain-free TPN, in particular, has appeared in approximately 900 academic papers as of December 2017, only five years since its introduction.9 Not relying on HKPs for western blot quantification is a break from traditional practices, but stain-free TPN proves to be a more reliable and accurate method. As more researchers adopt stain-free TPN, confidence in the quantitative power of western blots will be restored. 1. Moskowitz PF, Oblinger MM. Transcriptional and post-transcriptional mechanisms regulating neurofilament and tubulin gene expression during normal development of the rat brain. Brain Res Mol Brain Res. 30, 211–22 (1995). 5. MacDonald K., Choe J., Elbaggari A., Zhu M., Alburo A. In-gel protein quantitation using the criterion stain-free gel imaging system. Bio-Rad Laboratories, tech note 5782B. 6. Yang X., Smith K., Thomas L. Comparison of the Criterion TGX stain-free precast gel system and standard coomassie staining procedures for running and imaging protein gels. Bio-Rad Laboratories, tech note 6008. 7. Yadav G, Liu N. “Trends in protein separation and analysis – the advance of stain-free technology”. BioRadiations, accessed June 13, 2018. 8. Ng P., Kaur K., Kohn J., Quinlan A., Habel J. Protein Purification workflow development using Bio-Rad’s NGC chromatography system and stain-free gel technology. Bio-Rad Laboratories, tech note 6530. 9. Selected publication list: total protein normalization in western blotting using stain-free technology. Bio-Rad Laboratories, tech note 6351.